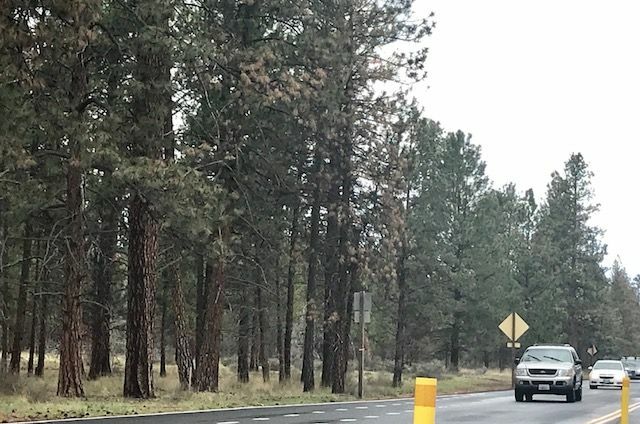 SISTERS, OR -- The Sisters Ranger District plans to remove a number of trees from along Highway 20, because officials say they’re a danger to the public. Between 2013 and 2015 the Oregon Department of Transportation used a chemical to kill off brush and grass in the highway right-of-way, through Sisters. Jean Nelson Dean, with the Forest Service, tells KBND News, "The herbicide was supposed to just remove brush and grasses, when ODOT was using it. It wasn’t intended to actually harm the trees, but it did. We started seeing those effects and now we need to deal with, unfortunately, these dead and dying trees." She calls it an "unintended consequence" and says ODOT no longer uses the chemical, called Perspective. For the next three weeks, the Forest Service will take public comment on the project, which is expected to get underway in the fall. "Those trees have been showing stress and dying off. We need to, basically, take these trees down because they could fall within the roadway at any time," says Nelson Dean, "None of them are imminent, like today, but we do need to treat them so that we’re protecting the public safety in the highway corridor." She says the Forest Service has discovered the trees can be used for wood products once they're felled. Those interested in learning more about the project should contact Michael Keown, Sisters Ranger District Environmental Planner at 541-549-7735. Comments can be made through mail, in person or via email. Comments will be taken for 30 days and can be made through mail, in person, or via e-mail.